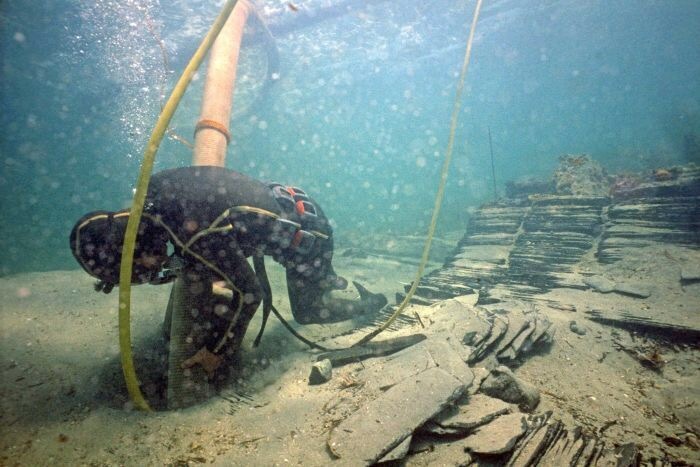 The New Daily reports that archaeologists from the Western Australia Maritime Museum have returned to the wreck James Matthews, a British merchant ship that sunk in 1841. The team’s goal is to create a detailed, 3-D model of the ship in order to closely monitor how the vessel’s condition changes in the future. “The idea is we will come back every few years and take another set of photographs and be able to overlay the models,” says former museum director Graeme Henderson. First discovered in 1973, the ship had sailed from London laden with farming equipment and other supplies for the newly established Swan River colony. Because much of the ship was buried in sand, its cargo was unusually well preserved. Research into the ship’s history also revealed the vessel had a dark past. Earlier it was known as the Don Franciso, and served as a Brazilian slaving ship that was seized by the British in 1837 with more than 400 slaves aboard.